Whether you are a new driver fresh to the road and whether you are an experienced driver, driving under bad weather conditions can be a challenging task, if not a dangerous one. In order to avoid dangerous situations or to minimize their potential risks Towing Long Beach’s experts have gathered a few important tips for driving safely under bad weather. Don’t drive: unless you absolutely have to go out, simply don’t. Whenever possible, try to avoid driving when the weather gets stormy. If you have to go out, try checking out if the weather is supposed to calm down later on. Sometimes, waiting for half an hour makes a world of difference. Make sure you’re well rested: driving tired is never a good judgment call, let alone when the skies decide to pour. If you have to drive in bad weather, make sure you’re well rested, fresh, and up for the drive. Focus: while driving, make sure you’re focused on one thing, and one thing only – the road. Avoid distractions such as putting the radio on too loud, speaking on the phone, or any other activity that might distract you. Planning the trip: try planning your trip in advance. The way you go to work each and every day might turn into a dangerous one when the rain keeps coming. Sometimes, a longer yet safer route is preferable. Speed: as a rule – take off 10Mphs of every speed you’re used to drive in. slowing down, even a little bit, greatly improves your control over your car and your chances of reacting in time to obstacles or dangers. Cautious driving: when driving in less than ideal weather conditions, extra cautious driving is called for. Such driving may include looking twice before changing lanes, keeping to the right lane, slowing down a bit more before taking turns, breaking gradually when possible, accelerating gradually, going into junctions more slowly and carefully, and the like. Tires: before hitting the road make sure your tires are in good condition and that they are sufficiently filled with air. Breaks: make sure your breaks work properly and that you’ll be able to easily stop your car on wet roads when in need. Blinkers: make sure your turn signals all work and are visible. This is especially important in bad weather. 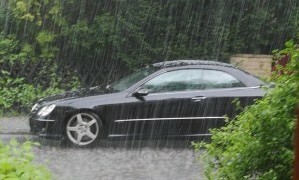 Wipers: bad or old wipers will make it extremely difficult for you to drive in hard rain. A smart move would be making sure your wipers do a good job keeping a clear view through the front windshield. Headlights and taillights: these are extremely important for both seeing where you’re going and to be seen by others. Facing oncoming traffic with broken headlights in the middle of a rainy thunderstorm is not an experiment we’d advise anyone to conduct. Remember: when it comes to driving under bad weather conditions, a lot is in your hands!